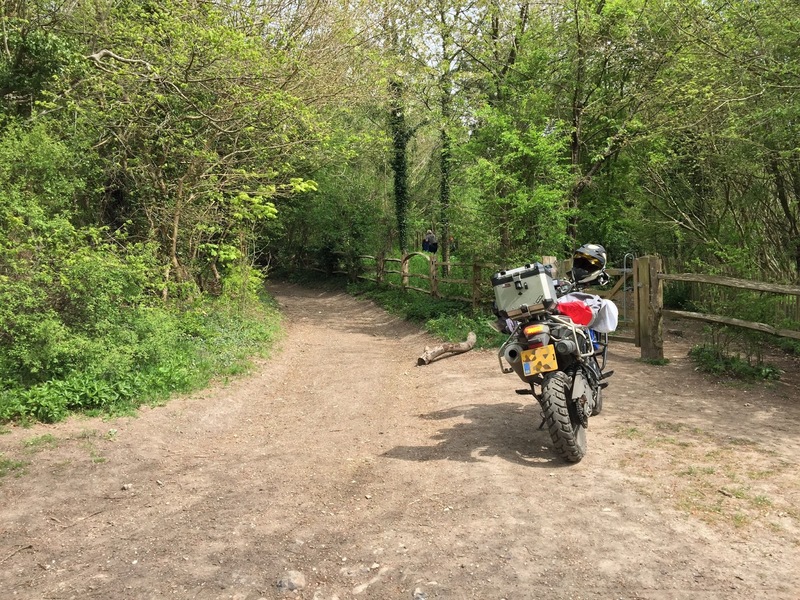 Today I went to the byways for a bit of off-the-tarmac riding and to bring Zev along so he could collect a few nettle plants for his garden. Usually I go alone if I’m riding in the dirt as 2-up riding can be slightly hairy on loose, slippery or rutted surfaces. I seized the opportunity to have Zev take a few video clips. 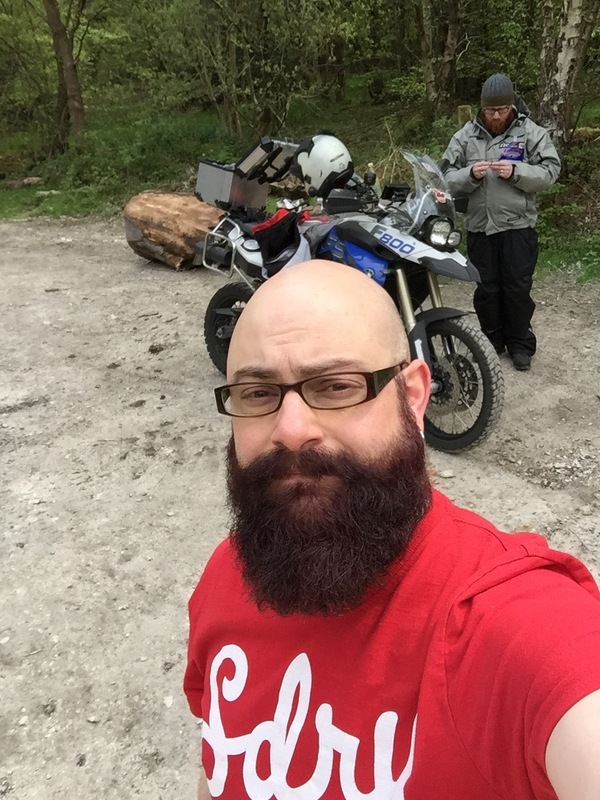 I believe off-road experience allows a rider to really learn about the handling characteristics of a bike and understand how it behaves when it breaks traction. 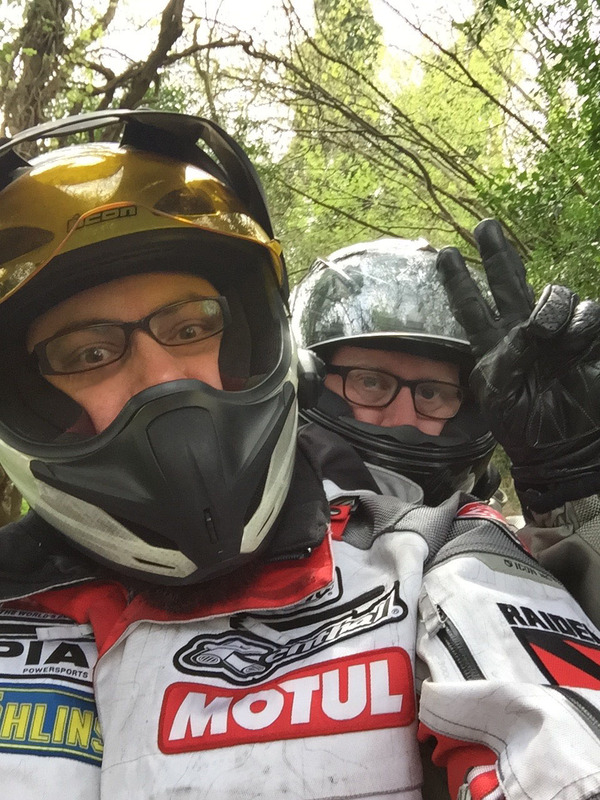 This understanding translates to a more relaxed rider on paved roads, especially in less than ideal conditions, enabling the rider to react naturally if the bikes slips unexpectedly, instead of panicking and stiffening up which will usually end in tears. Unfortunately, many dual-sport bikes are sold more for posing duty than for their off-road capabilities (much like Land Rovers and the like), but I say these riders are missing out some of the most pleasurable riding—being able to access the lesser travelled roads in safety and relative comfort. Indeed, most dual-sport bikes come with glorified road tyres from the factory, some with a no cost option of more knobbly tyres. 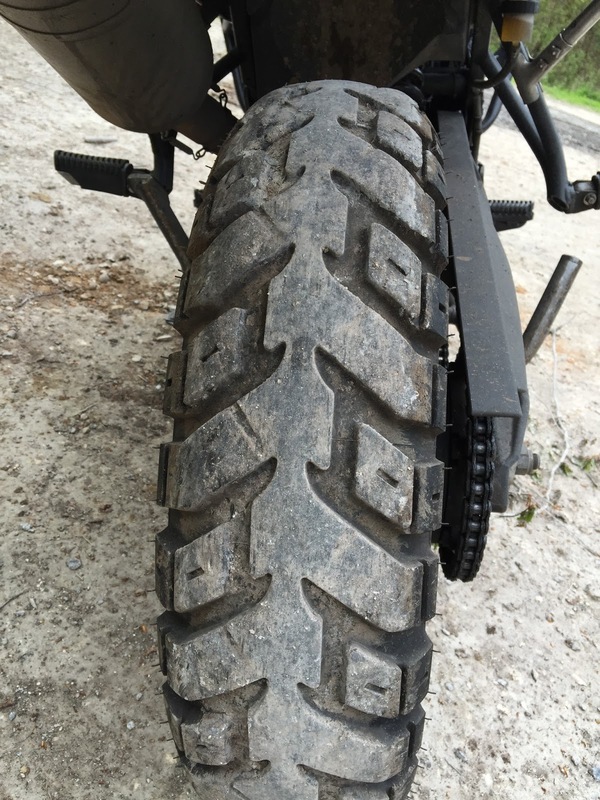 My F800GS came with Pirelli Scorpion Trails, not a bad tyre on the road, but next to useless in anything slippery. For anyone intending to do much off-road riding, the right tyres are a must. 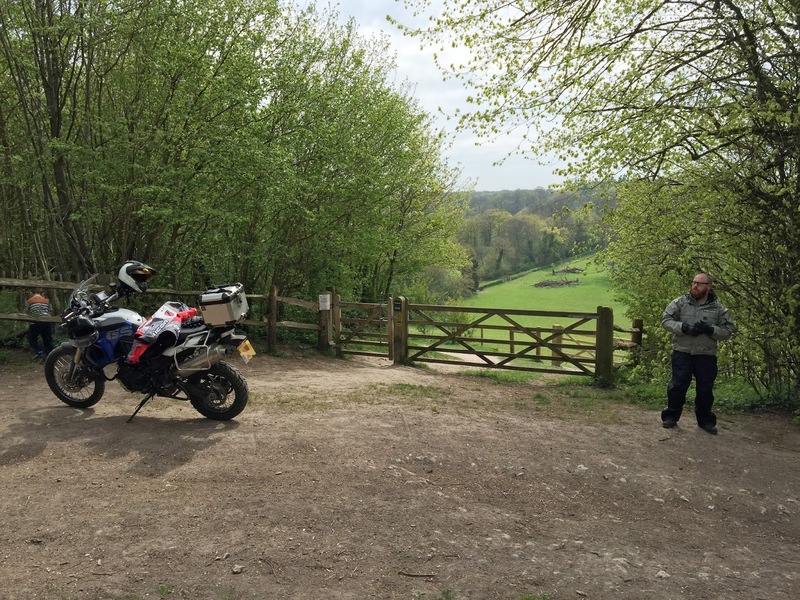 I use Heidenau K60 Scouts on my F800GS which provide a good blend of on- and off-road grip. For those who don’t do much riding off the tarmac, the thought of doing so can be daunting, but it is possible to safely maintain a decent speed even on loose surfaces like gravel and dirt. The bike is more stable with the rider’s bottom off the seat (practice those squats! ), as this lowers the centre of gravity to the foot pegs and allows the bike to glide over bumps without throwing around the rider. In the clip above I’m doing roughly 30 mph and the bike is completely stable. It is key to keep a relaxed grip on the handlebars to allow the front wheel to move around naturally—too firm a grip can cause the bike to destabilise and lose control. Remember—the bike wants to stay upright when the wheels are turning, all by itself, so don’t fight against what it wants to do. In slo-mo you can clearly see the front lift (that’s why we keep a relaxed grip on the handlebars) and the rear wheel spinning. The wiggling of the back of the bike is due to the spinning wheel taking the path of least resistance and following any ruts/imperfections on the road surface. The F800GS’s ABS system is so quick there is no perceptible stopping of either wheel, even in slo-mo, but the bike doesn’t stop very quickly. Newer models such as the F800GS Adventure and the R1200GS have off-road ABS modes (Enduro on both, and Enduro Pro additionally on the R1200GS) which allows for varying degrees of lock-up between each pulse of the system—maintaining enough rotation for the bike to stay upright, but enough lock to stop effectively on loose surfaces. 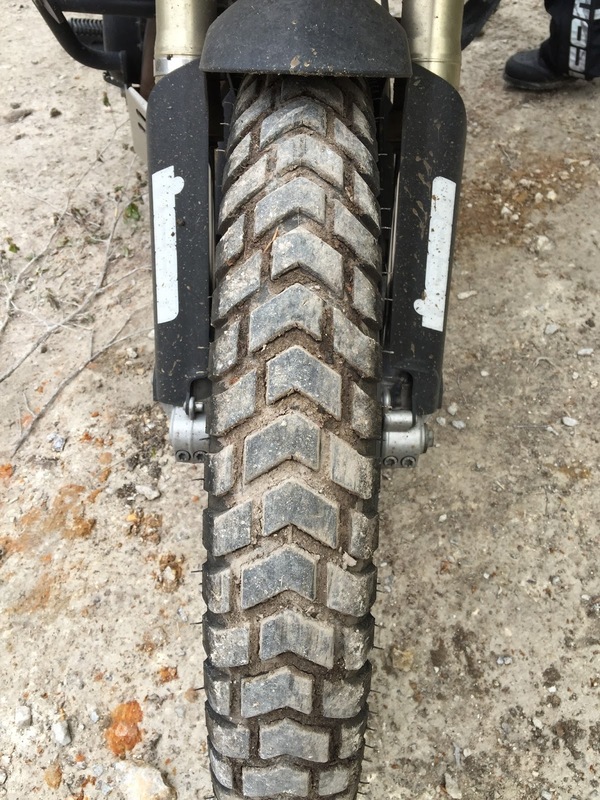 The Enduro Pro mode on the R1200GS (which is designed to be used with knobbly off-road tyres) only activates on the front wheel, allowing the rear wheel to be fully locked for cornering techniques. The byway in this clip is quite steep at the beginning but the surface is fairly good apart from some light ruts. 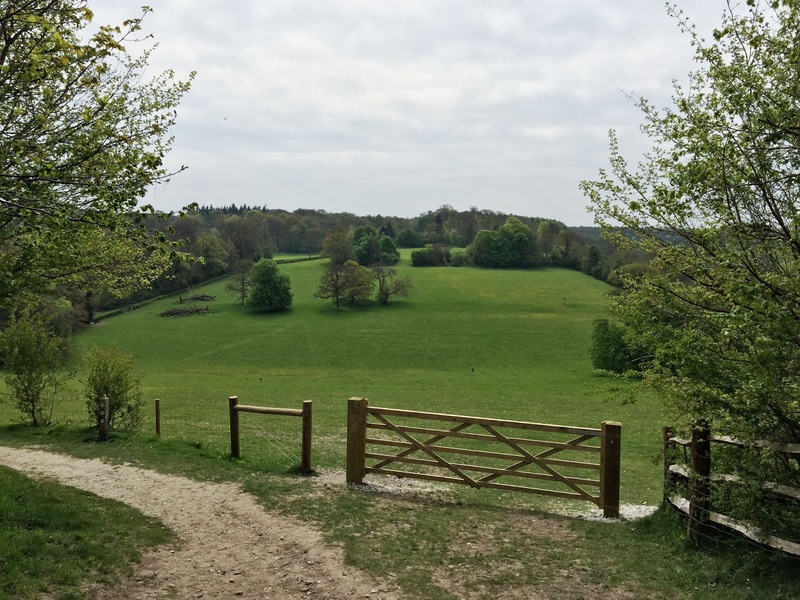 At the top of the hill, the roadway becomes angled which presents more of a challenge on a bike (being a single-track vehicle), as it wants to settle at the lowest point due to gravity and the gyroscopic effect of the wheels turning. 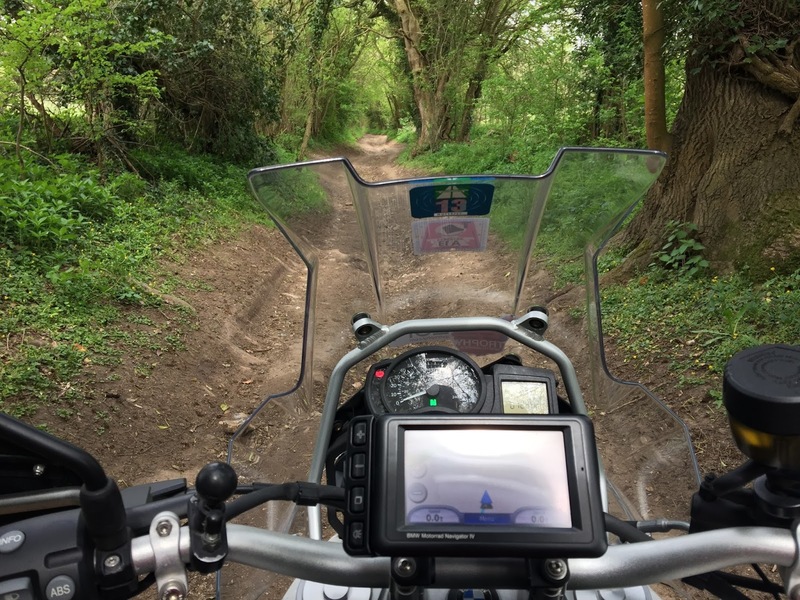 When travelling 2-up it is even more important to be aware of bumps, rocks or ruts, as the bike will be far less forgiving, and the suspension will be taxed with the extra weight. Also, it is impossible for both the rider and pillion to stand on the pegs meaning their weight acts as a deadweight and it is quite easy to bottom out the suspension (not a good thing as components can bend). Keeping the speed low, consistent and smooth will keep both the bike and the rider/pillion much happier. Any thoughts to add or experiences of your own? Let me know in the comments below.